The following is an excerpt from an interview a couple of years ago. An environmental campaign Spike has recently been involved with is The Right to Peace and Quiet (now The Noise Network). He regards noise as a form of pollution which is reducing the quality of many people's lives. "Noise addresses you wherever you go: there's noise on the train, the plane, in the supermarket, even when you go into one of those new toilets in London. One day I thought, who are the composers? What kind of respect can you have for composers who play their music for people to defecate to?" Spike moved to his current home in rural Sussex to escape the noise in London. He sympathizes totally with people who feel they are being driven over the edge by blaring televisions, hi-fi's, and barking dogs. "We have had thousands of letters from people forced to leave their homes because of noise. And there seems to be little that can be done about it." 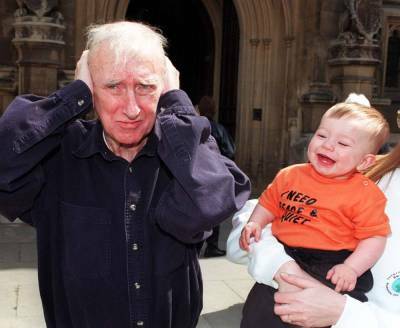 Spike believes it should be made law that those who make other people's lives misery by making excessive noise should be sent to prison for a year. Noise does not appear to be a problem where Spike lives now and has been living for the last three years. His house is located just a few miles outside of the south east coastal town of Rye. No trains or buses go past his door. His living room window commands an inspiring view of quiet, still flat fields, and the only sounds to be heard are our own voices.